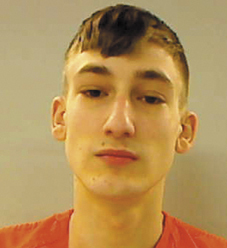 GARDINER — An 18-year-old West Gardiner man spent Thursday night behind bars after a police dog tracked him down after a short car chase through the city. Milton Libby was arrested and charged with operating without a license, criminal speed and eluding an officer. Police said there were no injuries. Gardiner police Chief James Toman said Friday that the incident began about 8:15 p.m. Thursday when a northbound vehicle on U.S. Route 201 sped past Officer Allen Alexander, who was at Laura E. Richards School, running stationary radar. Toman said a red 2001 Ford Taurus approached the school, which is in a 30-mph zone, driving more than 60 mph. He said Alexander activated emergency lights and siren on his police cruiser and tried to stop the car, which kept moving toward downtown. Toman said the car crossed the Pearl Harbor Remembrance Bridge to Randolph, turned left and went to Chelsea, turned right onto Cheney Road, then right again onto Davenport Road. At the Davenport and Hankerson road intersection, the car veered off the road and the driver got out and ran away, Toman said. Toman said the chase lasted four to five minutes and did not endanger anyone. He said the vehicles’ speeds slowed as they went through the city. Toman said Kennebec Sheriff’s Office Cpl. G.J. Neagle responded to assist with his tracking dog, who found the driver, Libby. “LIbby admitted he was the driver and that he decided not to stop because he was operating without a license,” Toman said. Libby was taken to the Kennebec County jail in Augusta, where bail was set at $1,500 cash. At a hearing Friday in Augusta District Court, a judge reduced Libby’s bail to an unsecured bond with a Maine Pretrial Services contract. Toman said another man, who was a passenger in the vehicle, was not cooperative with investigators but was not charged.